Over the years, we have experimented with several practical construction techniques to meet our simple needs for shelter. Whether it is in workshop spaces, animal shelters, greenhouses, or private homes, we have tried many practices and there is still much more to learn about and experiment with. 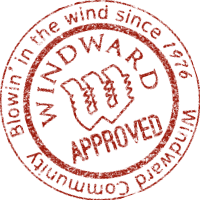 At Windward you will get to see what we are doing with sustainable construction, and participate in any number of building projects we've got going on. As time moves forward we are working to construct more housing and community facilities using the site-appropriate techniques we've worked with on a smaller scale. Such as earth-sheltered construction and designing buildings in ways that maximize heat retention and natural lighting. Earth sheltering a building allows the thermal mass of the earth to moderate the cold of winter and the heat of summer. 1997, construction of our earth sheltered community dining hall in progress. Even if you do not come to windward to specifically study sustainable construction, you will enevitably learn about some of the details that go into making passive systems effective and reliable. Goats help build a covered area to house a strawbale/cob bench. At this point, Windward has not invested a lot of time into learning about natural building techniques. This is for good reason. Over the last 20+ years, we've been focusing on other things like putting in the county-approved septic systems, laying over 2 miles of water and electircal through the forest. In other words, energy has been given to literally laying the foundation for the housing and buildings to come. We go into more detail about this in the Integrated systems page, but it bears repeating. In everything we do, the mantra is intergration, integration, integration. Whether we are creating functional community living spaces or insulated greenhouses that can house living systems that produce food, we continually strive to take into account the variety of goals that any given space intends to achieve. As we look at our needs as a community, we have to factor in the ecological, financial, practical, and social/psychological impacts of anything we construct. 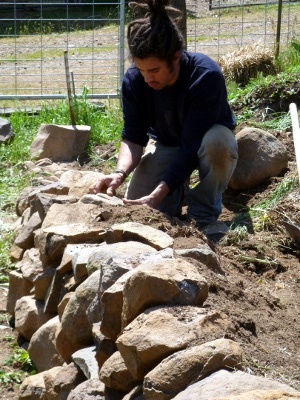 Jeff, 2012, builds a stone retaining wall for the garden. Earthworks include such activities as building level terraces on our gardens, digging hulglekulture beds to hold soil moisture for fruit trees, and laying out and placing fencing for pastures and animal pens. For some folks, this might seem unintuitive. But sustainable construction extends well beyond building houses and buildings. We are engaged in a variety of construction forms as we carve a niche for ourselves in this forested hillside. The Pearl is intended to be a facility where we can use compost to grow Black soldier fly larva, use the larva to raise fish, and then use the fish waste to grow vegetables, all in one integrated, thermally insulated building. The spring 2012 crew after completing the north wall of The Pearl. C-Wall is the temporary name for the foundation for an earth-sheltered greenhouse that will help us extend the growing season into the early spring and late fall. The combination of earth-sheltered construction and passive solar heating will create a space that will require only back-up heat during the winter. With the green plants and the warmth, we expect it will become a popular place to hang-out during January and February!